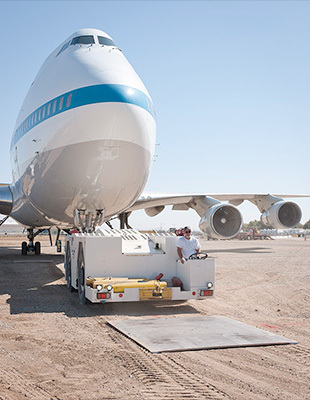 — For the second time this year, a NASA jumbo jet used to ferry space shuttles across the country has been moved for public display. 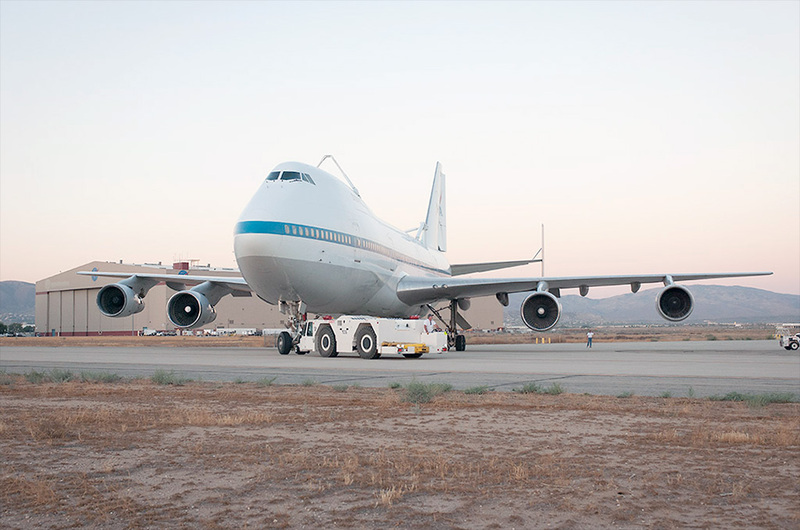 The younger of NASA's two modified-Boeing 747 Shuttle Carrier Aircraft (SCA), known by its tail number N911NA, or NASA 911, was towed three-quarters of a mile (1.2 km) on Friday (Sept. 12) from an aircraft operations facility to the Joe Davies Heritage Airpark in Palmdale, California. The early-model airliner, distinguished by two large vertical fins attached to the ends of its horizontal tail, was parked next to a Boeing B-52D "Stratofortress" bomber on the west side of the outdoor aircraft museum. NASA 911 will now join the Airpark's other displays available to the public Friday to Sunday weekly. 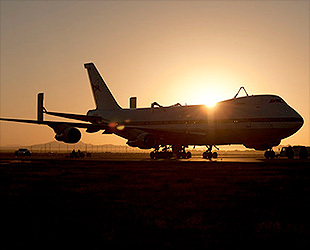 NASA 911 was retired in February 2012 after 23 years in service to the space agency. It flew a total of 386 flights as a Shuttle Carrier Aircraft, 66 of which were ferry flights with a space shuttle orbiter mounted atop its fuselage. It was built in 1973 and for its first 15 years flew passengers for Japan Air Lines. Among the NASA shuttles it flew piggyback from Edwards Air Force Base in California to the Kennedy Space Center in Florida was Atlantis following the 2009 final mission to service and upgrade the Hubble Space Telescope. NASA 911's first flight as an SCA was on Sept. 25, 1990; its first ferry flight was made with the space shuttle Endeavour on May 3, 1991. 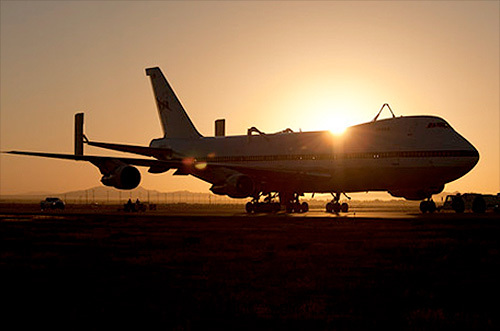 Upon its retirement, NASA 911 had amassed 33,004 flight hours over its 38-year flight career. After making its final flight, the jetliner was initially set aside to serve as a parts provider for NASA's Stratospheric Observatory for Infrared Astronomy (SOFIA). Also based around a modified Boeing 747, SOFIA uses the jumbo jet as a platform for a 100-in. (2.5-m.) reflecting telescope. 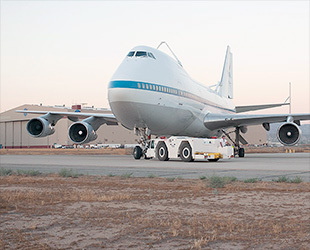 Though it is now parked at the Airpark, NASA is retaining ownership of NASA 911. The Armstrong Flight Research Center has provided the aircraft to the City of Palmdale on long-term loan for its public display. NASA's original Shuttle Carrier Aircraft, NASA 905, is now on display at Space Center Houston, the visitor center for NASA's Johnson Space Center in Houston. That aircraft, which flew NASA's first shuttle approach and landing tests in 1977 and, after 70 ferry flights, delivered the shuttles to their own museum homes at the end of the program, was retired in November 2012. NASA 905 is the centerpiece of a new $12 million public attraction scheduled to open in 2015. A full size replica of a space shuttle orbiter was mounted on top of the SCA in August. When the exhibit opens, the public will be able to tour inside both the mock shuttle and historic aircraft. At present, the public visiting NASA 911 in California can only view the outside of the historic craft. The Joe Davies Heritage Airpark has plans though, to eventually open the SCA for tours inside. The Airpark, which features almost 25 historic aircraft and related artifacts in an outdoor park-like setting, highlights the aerospace heritage of the surrounding area. It is open to the public free of charge from 11 a.m. to 4 p.m. Friday, Saturday and Sunday, with guided tours available Monday through Saturday upon request.